At this pont it would probably save time to tell you when a Serge Lutens scent doesn't have a stewed-fruit opening, because it seems to be a trademark of his. Daim Blond certainly does, but unlike the others, this one is more a suggestion than a big, showy opening act. "Daim Blond" means "white suede", and after the cooked-apricot opening with its hint of spices, suede is just what you get: smoother and creamier than you'd expect from a leather scent, and wrapped around a little floral bouquet in which iris dominates--but very soft and pillowy, not at all the aggressive iris that I hate (and that hates me back). This all sounds as if it might be exaggeratedly dainty, not just feminine but hyper-feminine, but in fact it's decidedly unisex, neither pretty nor rough. It exists in some rarefied space where scent simply is (a space that many Lutens scents occupy), without consideration of gender, concerned only with being fascinating. The base, of a piece with the rest of the scent, is warm and plush, musky without being heavily animalic. The most surprising thing about Daim Blond is how quiet it is. Plenty of Lutens scents are big, aggressive things; even the florals take up a lot of space. 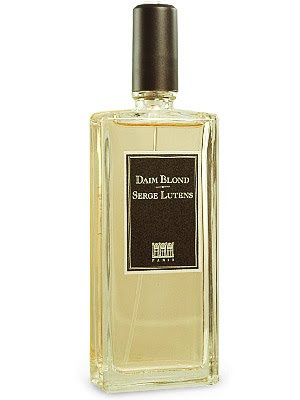 Daim Blond is just what an idealized leather ought to be; a caressing second skin.